An oiled bird is cleaned. Photograph courtesy of Tri-State Bird Rescue & Research Inc. When a hurricane strikes, the human loss is palpable. Where I live, in New Brunswick, NJ, downed trees and broken windows were the worst of the damage. It takes only a short drive to reach places where the devastation was much worse. In some places people are still without power in their homes. In other places they have lost their homes entirely. Hurricane Sandy caused extensive environmental destruction as well. You may have seen images of New Jersey’s storm-ravaged barrier islands on the news. In some cases it wasn’t the wind and flooding that caused the damage but the forces they released. In northern New Jersey, several oil refineries were damaged by the storm in spite of preparations made before the storm. Oil from these refineries spilled into surrounding wetlands affecting hundreds of geese, ducks, turtles and other wildlife. Unlike large open water oil spills, such as the 2010 disaster in the Gulf of Mexico, smaller fresh water spills rarely receive national media attention. Yet the damage caused by these smaller spills accounts for the majority of wildlife casualties. Fortunately, Tri-State Bird Rescue & Research Inc., a wildlife rehabilitation facility located in Newark, Delaware, specializes in oil spill response. Lynne Frink founded Tri-State in 1976 after witnessing the devastation caused by a series of oil spills on the Delaware River. 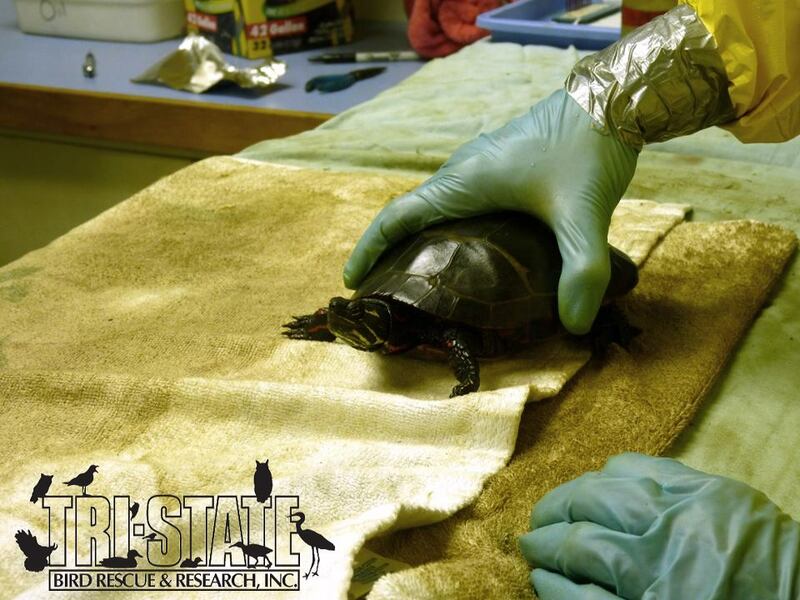 Since then, Tri-State has researched the effects of oil on wildlife and developed effective treatment and response procedures that are used across the country. This turtle was a victim of the oil spill. Photograph courtesy of Tri-State Bird Rescue & Research Inc.
After Hurricane Sandy, Tri-State has led the effort to catch, clean, and care for birds and other wildlife affected by several oil spills in New Jersey. Suzanne has attended Tri-State’s Oil Spill Training Workshop, and was recruited to help clean oiled birds. Knowing they were short on volunteers, Suzanne asked if I could come as well. We met at Tri-state on Thursday November 8th. I watched a short training video, and then was put to work. Eight Canada geese had just arrived. Together with other volunteers, I held the oiled birds while Tri-State veterinarians Drs. Erica Miller and Charity Uman examined them. First, we weighed each bird and took its temperature. Feathers provide waterproofing and help regulate a bird’s body temperature. When the feather structure is compromised by oil, it does not provide adequate insulation and the birds and can get dangerously cold. The birds were given fluids to hydrate them. Many were emaciated. The vets took blood and feather samples. They cleaned around the bird’s eyes and beaks. Oil is bad enough on the feathers, but it can also cause chemical burns to the eyes and skin. When ingested, it can damage internal organs. Before returning the birds to the waiting area, each one was given a temporary leg band and photographed for evidence. With oil spills there are legal considerations. Federal law requires the company that spilled the oil to pay for clean up. I was not permitted to photograph oiled birds because the images would be considered evidence. Water birds were not the only animals affected by the spill. A large snapping turtle and a little garter snake were also among the incoming patients. Although Tri-state is primarily a bird facility, they treat all oiled wildlife. 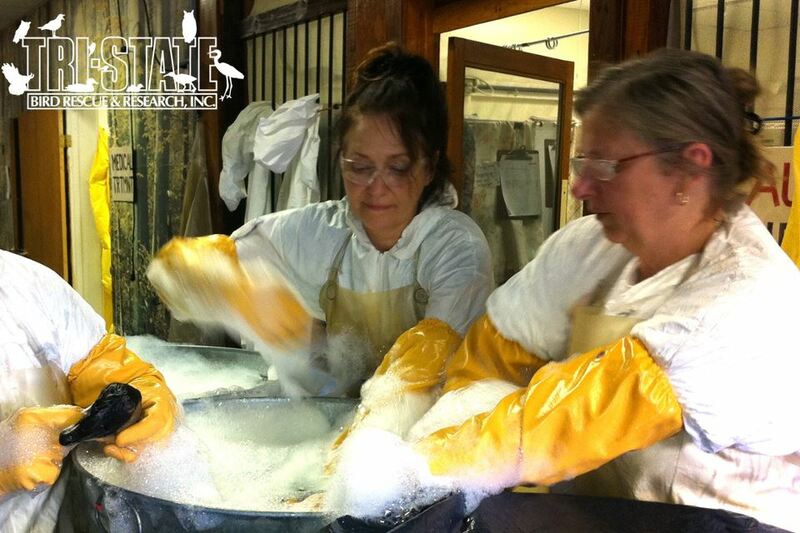 Suzanne and I spent the whole day helping to clean enclosures and prepare food for the animals. It was wonderful to see the transformation in the animals after they were cleaned and fed. As their health returned, so did their wild spirits. Many began to groom themselves and interact with each other. Unfortunately, help arrived too late for many animals. Rehabilitating oiled wildlife is challenging. In addition to the oil, other unknown storm water contaminates can add additional complications. For animals that do survive, there is the matter of where to release them once they have recovered. They cannot be released into an environment where they may become re-oiled. It has been learned from experience that birds released elsewhere often find their way back to their original homes. Fortunately, many of the turtles and birds affected by this spill have already been released. The oil clean-up efforts are going well. It will take time for the habitat to recover, but the immediate danger of re-oiling has been addressed in many places, allowing wildlife to return to their homes. This holiday, I give thanks that my town escaped the worst of the hurricane damage. I am thankful to all the people who gave (and continue to give) their time to help the people and animals hurt by the storm. I am also thankful to Tri-State for giving me the opportunity to be a part of the clean-up effort. If you would like to help wildlife affected by Hurricane Sandy, please consider making a donation to Tri-State Bird Rescue & Research Inc. For more information about Tri-State, oiled wildlife, and what to do if you find at oiled animal, please visit Tri-State’s website. Thank you so much for the well-written article. We need more people like you who appreciate the work done at Tristate!